Find the Weber iGrill 2 at Foreman’s General Store in Colleyville, Texas. For the connected chef. Grilling is more than what sears on the grate – it’s a lifestyle. Everything from picking out the best cut of meat, to that first mouthwatering bite. 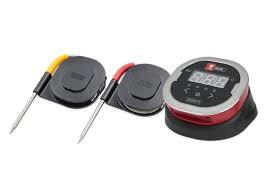 Take care of the details while the iGrill 2 Bluetooth® thermometer monitors what’s under the lid. With four temperature probes (two included) and the Weber iGrill app, you can rest assured that the entire meal is grilled to perfection.